Student Money Saver thought it would be interesting to survey students and ask them how much they are paying vs. how much they personally value their degree at. 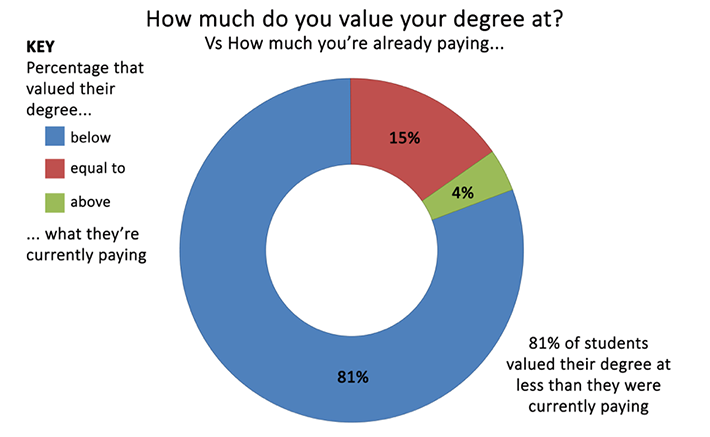 We asked students how much they personally valued their degree at:Only 16% of students valued their degree at £8000+, despite 73% of the students surveyed currently paying this amount. This is roughly in line with tuition fees at large in the UK (75% of institutions currently charge a blanket £9000 across all their courses). 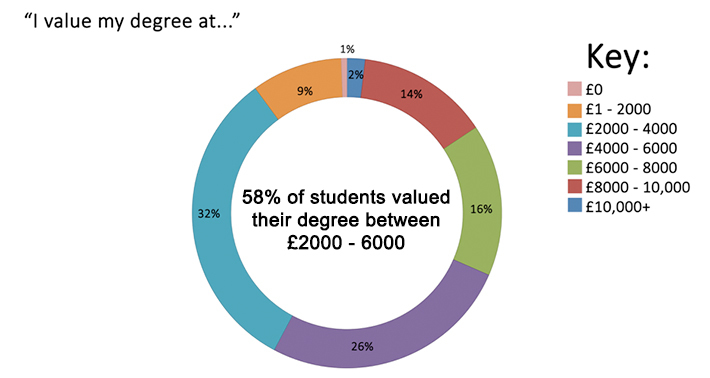 58% of students valued their degree between £2000 – 6000. 81% of the students surveyed valued their degree at lower than what they were currently paying. 15% valued their degree at the same amount, and only 4% valued their degree at more than what they were paying. 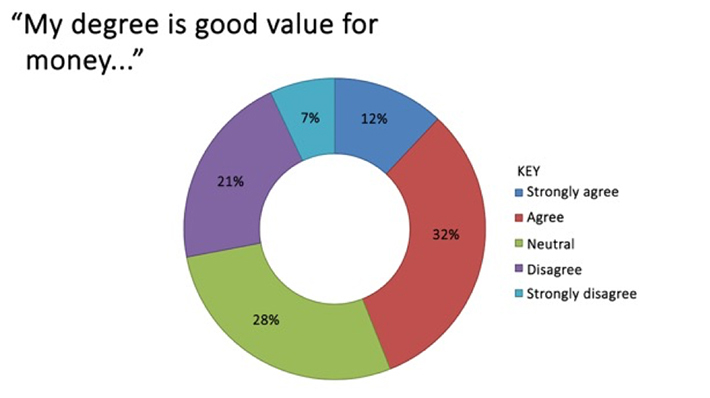 44% agree or strongly agree that their degree is good value for money, less than half of those surveyed, and 28% disagreed or strongly disagreed that their value was good value for money. Students are still optimistic that their degree will increase their earning potential, 69% agreeing or strongly agreeing. 9% believed that their degree wouldn’t help them earn more money once joining the workforce. Students were less optimistic that they’d earn enough over their lifetime to cover the cost of their degrees. 56% believed they would cover the cost, whereas 19% (a significant amount) didn’t. Student Money Saver’s survey has found that students value their degrees at lower than they are paying. They are broadly dissatisfied with high fees and do not believe their degrees are good value for money. 84% of students valued their degree at under £8,000, which is pretty significant when the current standard university fee is tending towards the maximum £9000, and 75% of institutions are now setting blanket £9000 fees across all their courses.